Free Wi-Fi gorgeous views and a heated outdoor pool keep our guests coming back to the Holiday Inn San Francisco-Golden Gateway. 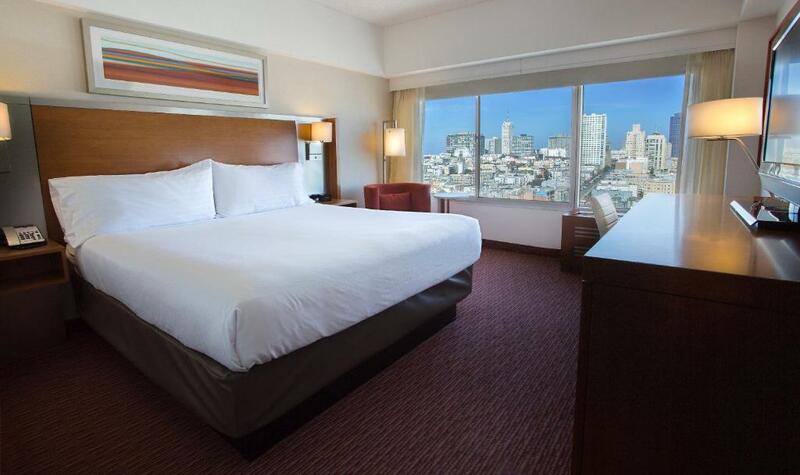 The 26-story 499-room hotel features mini-fridges and flat-panel TVs in every room but you may just prefer to take in sweeping views of the city and the bay. Work out the kinks in the 24-hour fitness room or bob around the pool (open year-round) feeling like the bathing-suited master of all you survey. Put office tasks to rest with the 24-hour business center and dine at two on-site restaurants. The Holiday Inn San Francisco-Golden Gateway is located in Nob Hill about a 20-minute drive from San Francisco Airport. The famous cable cars are just a short walk away and will take you to Chinatown for dim sum in 10 minutes and to quaint Ghirardelli Square for shopping and atmosphere in 20. Just 15 minutes by car will take you to legendary Haight-Ashbury district or the San Francisco Botanical Gardens nestled in Golden Gate Park. The hotel has parking on-site (for a fee). San Francisco is a pretty city that's for sure and The Negotiator is a man who appreciates beauty. He wants you is to take in the views without feeling taken by the price tag. Now that's a pretty picture.